Renowned for hisportraiture and depictions of rural landscapes, the eighteenth-century British artist Thomas Gainsborough (1727–1788) is best known as a painter. However, he was also a draftsman of rare ability who extended the traditional boundaries of drawing technique, inspiring an entire generation of British artists such as John Constable (1776–1837) and J. M. W. Turner (1775–1851). Beginning May 11, the Morgan Library & Museum presents an exhibition solely focused on Gainsborough’s works on paper, bringing together twenty-two outstanding examples in graphite, chalk,oil paint, and other media. Included in the show, which runs through August 19, are preparatory studies, finished works, and exercises made for the artist’s own enjoyment. A Boy with a Book and a Spade, 1748, The Morgan Library & Museum, III 59b. Photography by Steven H. Crossot, 2014. 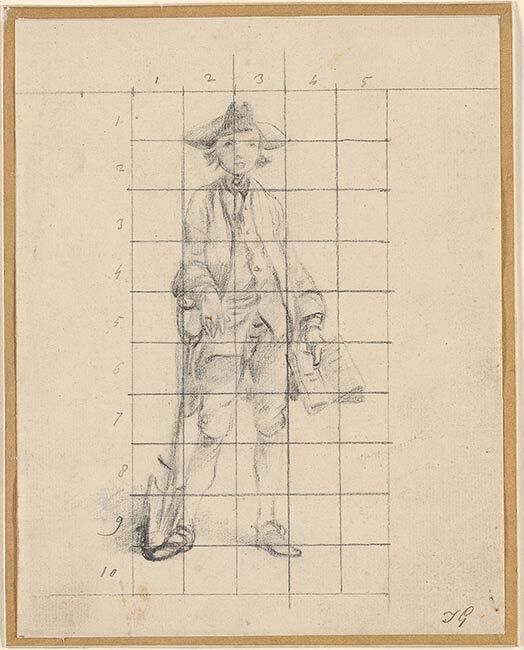 A Boy with a Book and a Spade(1748), served as a study for the signboard of a village school. Minor commissions such as this were a primary source of income for a novice painter like Gainsborough as he tried to establish his career. In Bath, where he moved in 1759, Gainsborough emerged as the era’s most fashionable and successful portraitist. There he became fascinated with the effects of light on fabric, often using black chalk to explore different tonal solutions. His renderings of sitters’ expressions and the rich texture of their clothing led to his reputation as the Anthony van Dyck of his time. 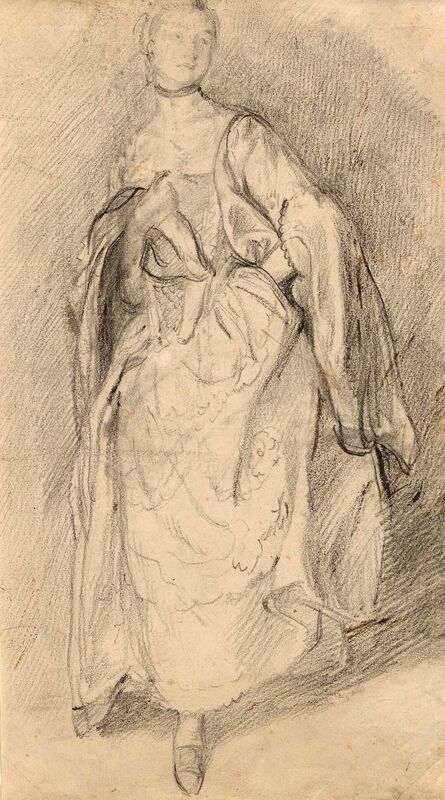 Gainsborough would later create figure studies with models in different poses, using inventive techniques intended to capture the viewers’ eye in an instant. Gainsborough would come to devote much of his time to creating landscapes of his own invention on paper. Laying out stones, branches, leaves, and soil of various colors on his worktable, he assembled and drew landscapes in his studio. In his quest for original effects, the artist often looked to rugged terrain, contrasts of light and shade, and the nuances of shadow resulting from the changing seasons. He explored the rolling topography of natural settings and gothic, shadowy atmospheres in his early years. They offered him almost limitless compositional possibilities as he simultaneously conducted his technical experiments: for instance, he immersed his paper in milk and varnished it to give his landscape drawings a transparent tint. In the mid-1770s, Gainsborough increasingly experimented with drawing by mixing different media and applying varnish to surfaces to produce landscapes that mimicked the visual effects of oil paintings. In the following decade, he would go on to produce variations of similar compositions drawn mainly in black and white chalk: serpentine, asymmetrical landscapes with moving skies, windswept trees, solitary animals, and scenes of agrarian life. 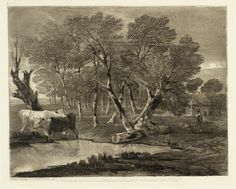 Wooded Landscape with Cows beside a Pool (1755-1780), a rare print from the collection of the Metropolitan Museum of Art. Toward the end of his career, he began favoring concepts rather than depicting a realistic view. In Figures in a Wooded Landscape, (1785-88), trees, animals and rocks lose their shape, and parts of the landscape veer toward pure abstraction. 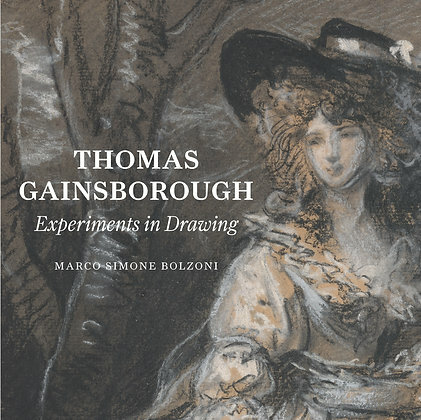 The accompanying catalogue, Thomas Gainsborough: Experiments in Drawing, features full-page reproductions of seventeen works in the exhibition, a foreword by director Colin B. Bailey, and essays by Moore Curatorial Fellow Marco Simone Bolzoni and conservator Reba F. Snyder.